Building on the proven performance of HemiPleat Gold Cone technology, GCX filters stay cleaner and last longer than conventional pleated filters. GCX filters were designed specifically for the new Gold Series X-Flo (GSX) dust collector. The unique location of the GCX filter in the collector enables more downward-facing media than standard, competitive systems. 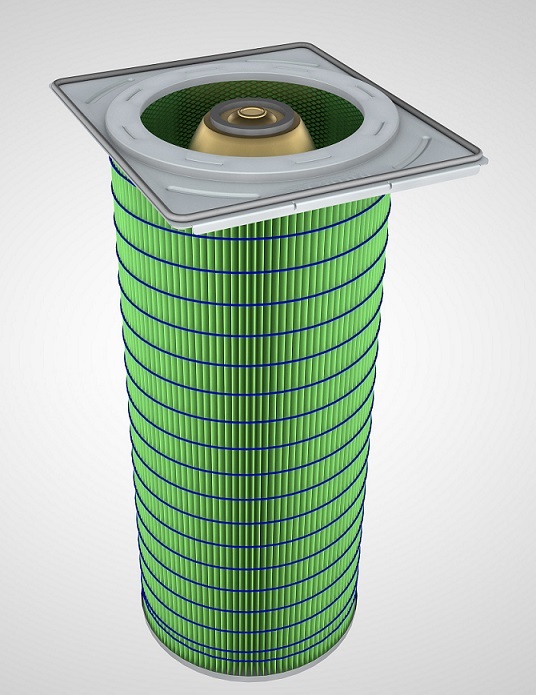 The cone is configured so that pulsed air is evenly distributed top to bottom along the outer pack of the filter and down through the inner cone pack. That means with each pulse, the GCX cone cartridge ejects more dust out of the collector, straight down to the hopper. This design offers an advantage over horizontal-style filters that pulse most of the dust back onto adjacent filters. Used together, the GSX collector and GCX filter are a powerful and cost-efficient dust collection system. The system maximizes airflow while minimizing filter change-outs, compressed air usage, and energy costs. GSX dust collectors are ideal for industrial applications that produce or process fine, fibrous, and heavy dusts and fumes. GSX dust collectors exceed OSHA mandates for indoor air quality and are tested to meet NFPA and ATEX standards. They are available with many explosion protection options including explosion vents, isolation valves, integrated safety monitoring filters, and fire-retardant filter cartridges. GSX collectors benefit industries like pharmaceutical, mining, food processing, and chemical processing, and metalworking applications like welding, thermal spray, plasma cutting, laser cutting, and abrasive blasting.